In more than 300 minutes (!!!) 2 DVDs feature the beauty of the Wunderland with all its craziest and most spectacular stories, interviews, and details. A Small World But Larger Than Life Or is it rather a big world really small? Decide for yourself and embark on a journey throughout Miniatur Wunderland. This two-and-a-half hour movie carries you off into a world full of wonders. Dive into deep canyons, vibrant metropolises, or an open-air concert with 21.000 fans – on the largest model railway layout of the world there are many things to marvel at. Hamburg, America, Scandinavia, Switzerland, Airport, or Knuffingen. This movie shows everything you might have discovered on your visit, already – and much more! 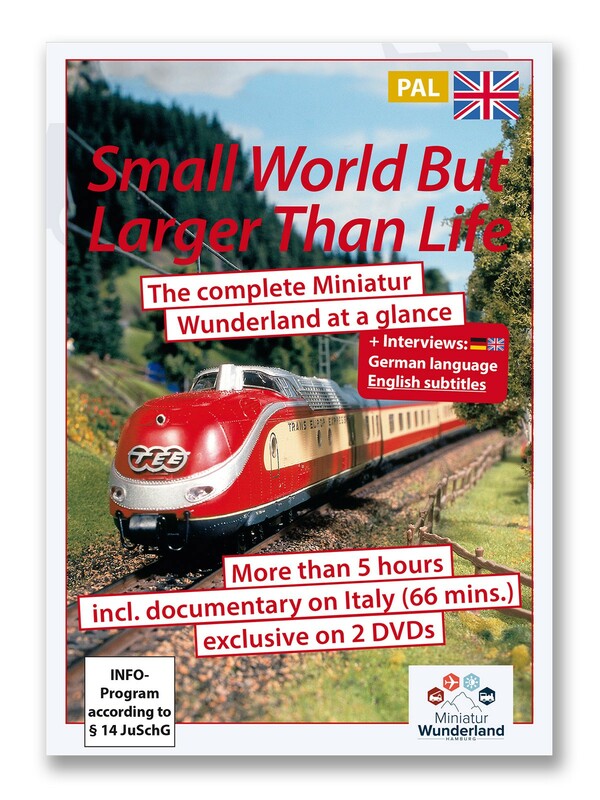 Exciting bonus features In exclusive interviews you'll get spellbinding background information right from the makers of Miniatur Wunderland. Whether layout planner, bridge builder, boss, or model maker – take a look behind the scenes of the largest model railway layout in the world, located in Hamburg. We'll also disclose the functioning of the car system. Experience the most fantastic day-and-night cycles at several layout locations. As a crowning finale, you’ll take a ride in the driver’s cab throughout the Swiss layout. Witness the greatest moments of the world’s largest model railway, firsthand. You've never experienced Hamburg's Miniatur Wunderland as all-embracing before! The most spectacular panorama views, the most beautiful model constructions, the craziest scenes. From knight's tournaments to extraterrestrials, or many fire fighting operations – you will experience it all on this double-DVD. Dive into this tiny world, and embark on the most exciting journey you can imagine!